An around the clock bridal shower is time to party! The beauty of this shower is two fold. You have a great theme to build your party around with the variety of a miscellaneous shower. This versatile shower concept is perfect for couples that need everything as well as those who really do not need much at all. For those that need everything, this provides the unique opportunity to provide much needed gifts to be used around the clock. With the different time assignments, there is also less chance for gift duplication. 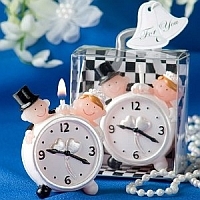 For brides or couples who have the basics, add some excitement with themed or holiday round the clock presents. The invitation plays a very important role in this themed shower. Put your guests at ease with a clear explanation of what is to come. The concept of an around the clock bridal theme is to shower the bride or happy couple with gifts to be used at any hour. Keeping with that theme, it is important to assign times to the guests in order to provide gifts throughout the day and night. Indicate on the invitation in a prominent location each guests specific time of day from which to make their gift choice. You can be as specific as a particular time of day such as 8:00 a.m. or 8:00 p.m. If you prefer a broader range of time, specify morning, noon or evening. For those couples who have everything, consider a holiday time of year gift assignment. Perhaps a Thanksgiving holiday would render a treasured platter to serve up turkey for years to come. Other creative times of day from which to choose would be breakfast time, bath time, cocktail hour, dessert time, bedtime or yard time. Be sure the time of day or theme is quickly noticed on the invitation. A key piece of information as important as this should be a major focus on the invite. Design accordingly. Ask the guests to include a gift tag on the outside of their gift that indicates the "time" they were assigned. Then the gifts can be opened in order, from morning to night. What could be more fun than an entire day of surprises! Mail your party invite in style with timely postage! These stamps are definitely for the hostess with an eye for detail. A postal stamp personalized to match the shower theme is sure to be noticed. Shower favors are a thoughtful way of thanking guests for sharing in the celebration. Everybody loves a take home gift no matter how small or extravagant. The around the clock shower theme yields many ideas for favors. Enhance the theme with favors that can be edible, useful, or anything in between. Let your imagination be your guide. Useful kitchen gadgets such as timers make an excellent choice. Edible favors such as clock shaped chocolates or loose candies make tasty tokens. These candies can be wrapped with a tag saying, "Thanks for sharing in this special time. Your presence made the celebration sweeter." The favors need not be expensive to make an unforgettable impression. An ordinary trinket can turn into a special extraordinary gift simply by the way it is presented. After you have selected your favor, find an interesting way to wrap it. A beautiful favor deserves beautiful wrapping. Favors can also double as decorations for your shower. Consider placing your favors in a unique container and using as a centerpiece on your food or gift table. Bridal shower gift etiquette dictates if you attend the shower you should bring a gift. This brings us to the question, what should I buy? With an around the clock shower your gift selection should focus on the time of day designated on your invitation. Next consider your financial situation and your relationship with the bridal couple. This will help narrow greatly the gift selection. If the Honoree is a casual acquaintance, a couple of coffee mugs would be appropriate, but if the Honoree is a close, lifetime friend a coffeemaker is probably a better choice. No matter what you decide to give a gift is always a meaningful gesture. Remember it is your thoughtfulness that counts, not the price of the gift. So express your love and support for the couple with an around the clock gift suggestion. . . When you consider a gift selection for the morning time, think of your morning routine. What does it take to get the day started. Then, consider the lifestyle of your Honoree and that should get the creative ideas rolling. Here are some of our favorite eye openers. . . This designated time is broader and could include just about anything. Whatever you think the bride might be doing at this time of day would be a great direction for your gift selection. To each his own is definitely true in this case. . .
Evening gifts are the perfect time to provide items that are particularly wanted. Pass out the relaxation with mix and match favorites to create a distinctive gift. Personalize for an extra touch to show you care. Sometimes evening presents are some of the most appreciated.